The first attempt I made was, well, a disaster. Why? Because I didn’t pay attention to the recipe. Lesson learned: Don’t assume, read! So, please read this carefully so you don’t make the same mistake. I will make this even easier for you and point out where I made the mistake. Do you see the highlighted bold 1 tbsp. of beaten egg? Yeah, if you use one full egg the dough won’t work and you can start over again. I was making a double batch so I used two full eggs, what a waste, I was very upset and the whole thing cost me precious time. Dissolve the yeast in the warm water and stand aside. Mix flour, sugar, salt, milk powder together in a bowl and add the yeast to it. Crack the egg and beat well otherwise measuring 1 tbsp can get a bit difficult. Combine egg with water and pour into the flour-yeast bowl. Mix until all is well combined. “Cooking with dog” uses a food process with a dough blade. Transfer the dough into the mixer and mix shortly. Add the soft butter too it and combine again. Dust your hands with flour and shape the dough into a ball which should be smooth. Place it into a bowl, cover with plastic wrap and keep it in a warm place for about an hour until the dough has doubled. After an hour, check the dough by poking you flour covered finger into the dough. If the hole closes you need to let it sit some more. Otherwise take it out of the bowl and place on a flour dusted surface. Flatten in carefully and weigh so that you know the total grams. Then divide into 6 equal pieces using your scale. Form a ball out of each piece and place on a cookie sheet lined with baking paper and cover with a slightly damp cloth to rest for about 15 min. 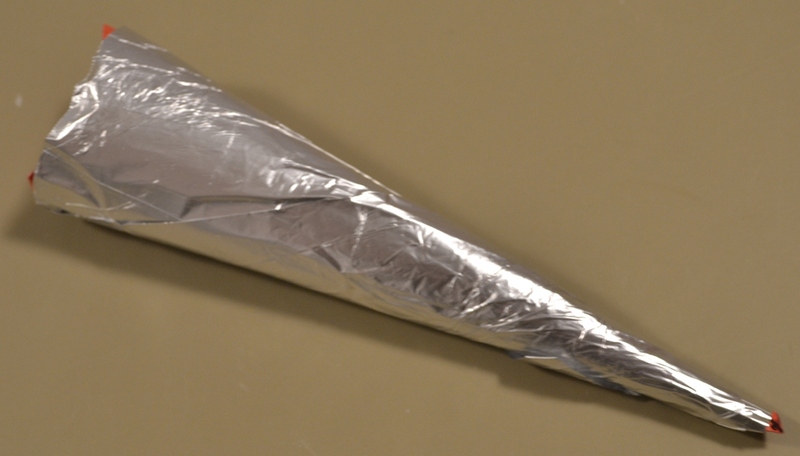 Home made cornet mold: crafting paper and aluminum foil. While you wait you can grease your horn molds with butter and set aside.Now take the dough balls and flatten each, folding length wise and roll them out into a reasonable length (it says 1 foot, not sure if I did it like that). The start at the thin end of the mold and wrap the dough around it. Pinch the end under and place them so that the end is on the sheet. Once you finished all cover with a plastic bag to let them rise in a warm place again, about 15 min. Brush with the rest of the mixed egg and bake at 200°C for about 10 min or until golden brown. Remove from the oven and place them on a rack to let them cool for a min or two. Then remove them from the molds and let them cool off completely. Tip 1: I had no dough blades for my food process so I used my KitchenAid with the dough hook. I am sure you could knead the whole thing by hand as well. Tip 2: Why cover the finial product with a plastic bag? Because plastic wrap will stick and you don’t want that. I used the cover of my cake caddy. Heat the milk, make sure you don’t overheat it. Mix the egg yolks with the sugar and add a bit of warm milk to thin it out. Then sift the flour, corn starch, cocoa powder and add to the egg mixture. Mix well until all is combined, then add the rest of the milk. Strain the mixture through a sieve into a pot and heat. Stir until you have a heavy pudding consistency. Remove from the heat and stir in butter and chocolate until melted. Place the pot into ice water and cover the pudding with a plastic wrap so that it won’t from a “skin”. Once your pudding and the cornets are both cooled down you can start filling them. Take the pudding and fill a pastry bag with it then fill the cornets and let them sit. The pudding that is exposed to air will dry out a bit but that is just fine. Cooled off, ready to be filled. 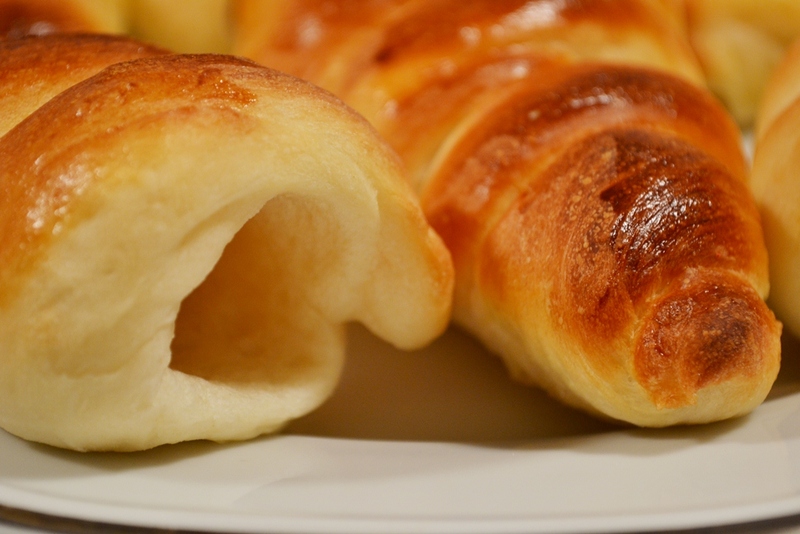 Tip 3: If your cornets have a hole at the thin end simply use a chocolate chip to close it. That way the filling won’t squeeze out when eaten. Tip 4: I haven’t tried it yet but I assume that you could make white or vanilla pudding by leaving out the cocoa powder and using white chocolate. Maybe add vanilla sugar too. 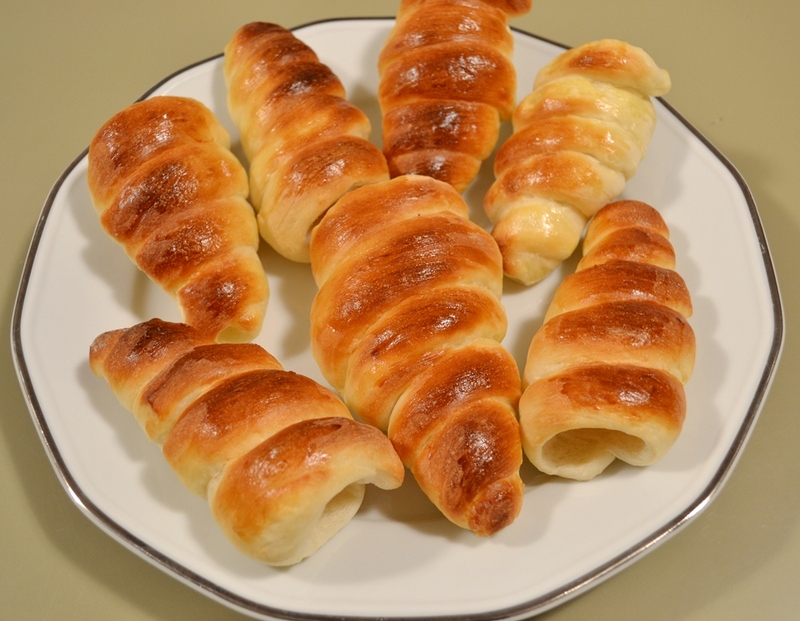 My family really enjoyed the chocolate cornets and they are a nice treat for the kids for school as well. Simply wrap them into some plastic wrap and add to the lunch. If you liked to see the YouTube video: Cooking with Dog – Chocolate Cornets. looks great 😀 I have a question though; how long are the cornet molds? Dear DontEatChalk, I am not sure how long the molds are. I didn’t measure them. However, you can make them any size you like. It really depends on how big you want your cornets. If you do make it, it would be great to see a picture of it. Hi there. Been dying to try this for so long. I would like to know if I can use regular cardboard like cereal boxes for the mold instead of buying craft paper? Thanks. You can use any cardboard you have at hand as long ans it’s bendable so that you can roll the shapes. I had red craft cardboard at hand but a cereal box will do too. I wonder why nobody said this – KONATA’S CORNETS! WOW! Thanks! haha. 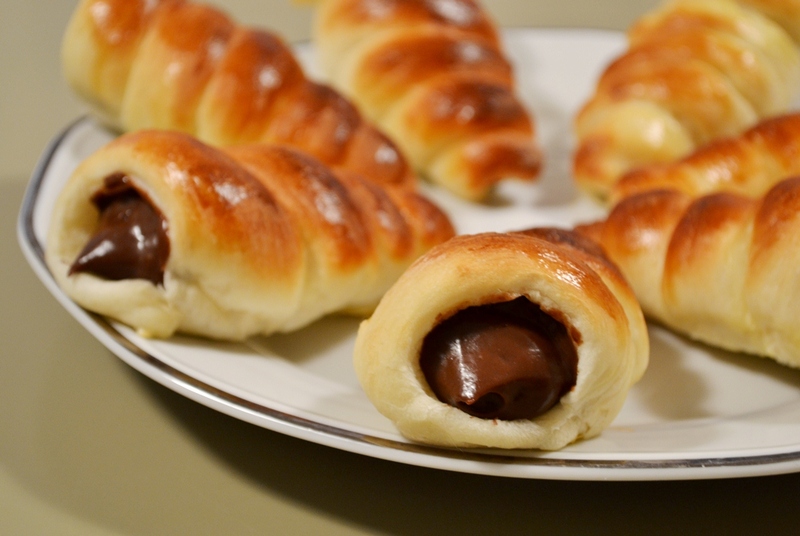 I decided I would make chocolate cornets from watching ‘Lucky Star’. Thanks to them, I know how to eat them. It is funny that people know them from Manga and Anime. Hope you enjoy them. good job on the first time baking. Glad you tried your hand on yeast dough right away. It seems they are a bit smallish but they look good nevertheless. I hope they tasted good too. For the next time, if you choose to try again, maybe give the dough some more time to rise. 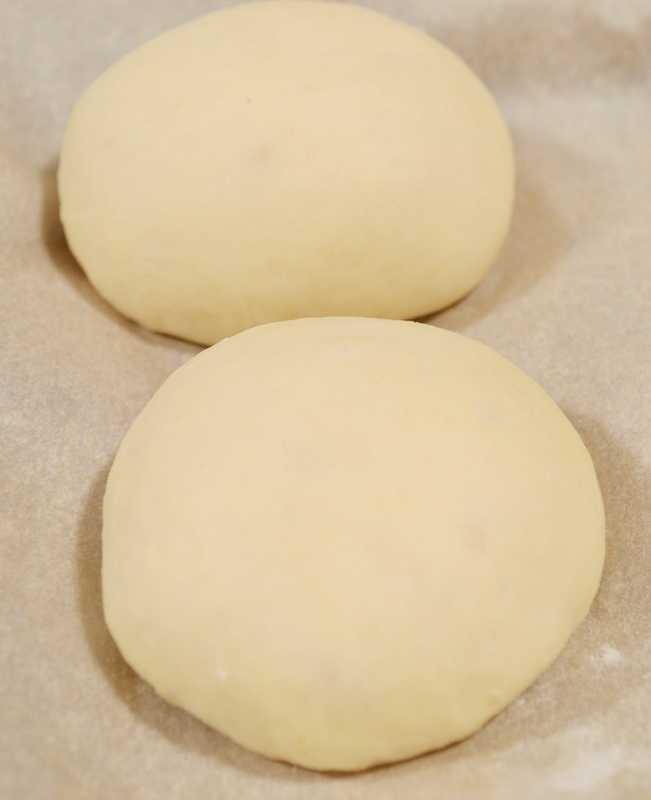 Also, when you handle yeast dough, use care and lightness of touch. Give it extra time to rise, adding 10 more minutes won’t hurt. With yeast dough it’s mostly a thing of experience. Remember how I wrote that I used two eggs instead of two tablespoon of eggs? Yeah, that was fun. The more you make it the better you will know what is right and what might not work so well. The real question is which end is the head? I think it’s the pointy one, but honestly, I do not know. I want to make a double batch too – so do I have to add 2 tbsp of egg? Dear Monique, the recipe, as it is listed, is for one batch. So double all ingredients to make a double batch, which means two tbsp. of an egg. I used regular all purpose flour for the recipe. I want to take a cornet to SchooI but we don’t have enough time to make them properly. 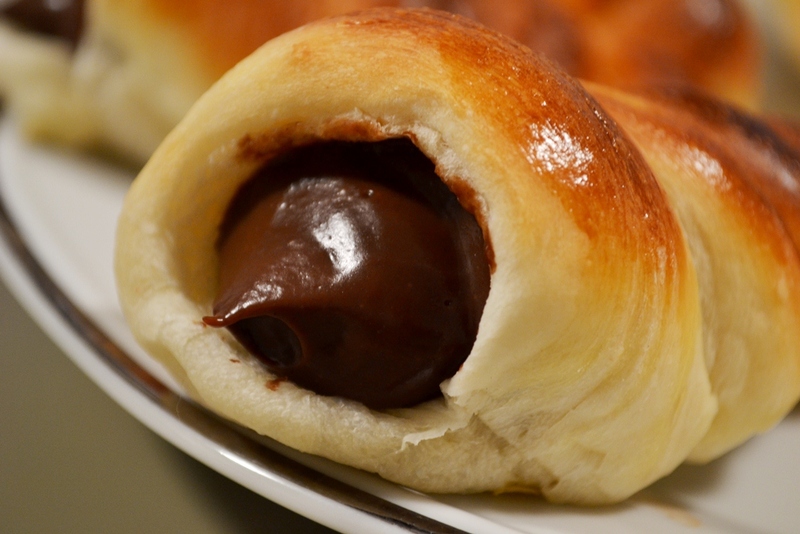 So I just take Crescent rolls and fill them with hot fudge… Is that okay? using Crescent rolls is an option. I haven’t tried it so I can’t say for sure, but give it a try. Is the instant dry yeast necessery? Yes, yeast is necessary because it is a yeast dough. You may also use fresh yeast, however the amount would be different. Can i proof them overnight in the fridge for the first proof? And.. Can i use this dough to make crescent rolls and buns too? I have never tried what you suggest, so I can’t say if it would work. The dough might collapse. You could use the dough for crescent rolls and buns. I was thinking of making these but with macha and strawberry flavorings. Besides the flavoring ingredients, is there anything else that I would need to change in the recipe? If you have a recipe for the filling with the desired flavours, use that. The filling recipe that is provided needs 30g of chocolate. When you remove that and add strawberry jam for example it might change the consistency of the filling. You can experiment of course and see how that works out. If you want to add flavours to the dough, then use matcha/strawberry powder and add a bit more liquid to make up for the extra dry ingredient. That should work out fairly well. we ate ours pretty fast because they are so good. I recommend to keep them in the fridge, then they should last several days. But I can’t give you an exact time. what kind of dough is this, can i use a pre-made dough just all those ingridents may be costly. how did the chocolate taste like was it pudding like never had something like that don’t know how the chocolate will look like. This is a yeast dough. I guess you could use a premade croissant dough. The chocolate is pudding like, maybe a tiny bit more solid, but not by much. it would be super awesome if you put in actual temps and cook times for the custard. the custard itself was a rather large disappointment while the dough was wonderful. I am sorry, but for that I can’t give you precise cook times. When the custard has a pudding consistency, that’s when it was done for me. Depending on how hot you cook it, and even where you live, it might take shorter or longer. Sadly, that’s not a precise science.